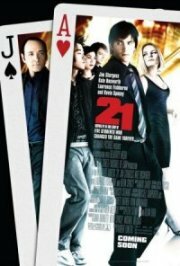 Loosely based on a true story, this is the tale of how a group of smart MIT students, coached by a statistics lecturer, took on and beat the casinos as blackjack. They used a technique known as ''card counting'', which, while not illegal, is enough to get you thrown out of a casino when detected. A sideline story revolves around one of the smartest guys, and his romance with the hottest babe on campus, who also happened to be on the card-counting team. Comments Mature theme that is clearly and positively resolved.